Arminian theology is not Reformed and is the opposite of Calvinistic theology. It is possible to develop a ‘hybrid’ of Calvinism and Arminianism. To be an Arminian is to promote heresy. It is not an orthodox evangelical theology. At the centre of Arminianism is belief in free will. Arminians deny the sovereignty of God. Arminianism is not a theology of grace. Predestination is not one of the beliefs of Arminians. Arminian theology denies salvation by grace alone through faith alone. Arminians believe in the governmental theory of the atonement, i.e. ‘God forgives sinners without requiring an equivalent payment’. Each of these 10 myths has been addressed and challenged by Roger E Olson in Arminian theology: Myths and realities (Olson 2006). However, in formal theological and lay-level discussions, these issues are raised. I struck one in an online forum. Arminians are syncretists meaning they believe salvation is both a work of God and man. You will here (sic) them say things like “I asked God into my heart” or “I accepted Jesus.” Calvinists & Lutherans are Monergists meaning they believe God does all the work in salvation. You may hear them say they have been regenerated. What is false about that declaration? She stated that ‘Arminians are syncretists meaning they believe salvation is both a work of God and man’. Does she know the difference between syncretists and synergists? Could she be referring to synergism and not syncretists? It is disappointing in this, her first post on this forum, that she provided not one piece of evidence to support her claim that Arminians ‘believe salvation is both a work of God and man’. This is false as a reading of James Arminius will tell us. I believe that sinners are accounted righteous solely by the obedience of Christ; and that the righteousness of Christ is the only meritorious cause on account of which God pardons the sins of believers and reckons them as righteous as if they had perfectly fulfilled the law. But since God imputes the righteousness of Christ to none except believers, I conclude that, in this sense, it may be well and properly said, to a man who believes, faith is imputed for righteousness through grace, because God hath set forth his Son, Jesus Christ, to be a propitiation, a throne of grace, [or mercy seat] through faith in his blood (Works of James Arminius, vol 1, IX). I am not conscious to myself, of having taught or entertained any other sentiments concerning the justification of man before God, than those which are held unanimously by the Reformed and Protestant Churches, and which are in complete agreement with their expressed opinions (Works of James Arminius, vol 1, IX). There is much false information in the public market place about the beliefs of Arminianism. If anyone is interested in some clarification on this topic, I recommend Roger E. Olson, Arminian Theology: Myths and Realities (Olson 2006). What Jacob Arminius wrote and what Arminians today claim to believe are probably quite different; just as, I, being a Calvinist, do not agree with all of what John Calvin wrote. I grew up in an Arminian church and was a staunch anti-Calvinist until a few years ago. Most of the people in my life are staunch Arminians. They will all claim that salvation is by grace through faith in Christ alone. However, they will say that you must “accept” this gift. If we have to accept anything, we are doing a work thus being a synergistic. However, there are many different flavors of Arminians out there today just as there are many flavors of Calvinists. What I will say is that I have yet to meet one who does not hold to a synergistic idea by what they claim whether they admit to it or not. My rejoinder was to her statement, ‘What Jacob Arminius wrote and what Arminians today claim to believe are probably quite different’. This is way too broad a statement and she has provided no examples to support her claim. To know what a chunk of evangelical Arminians believe today, I suggest a visit to a site such as the ‘Society of Evangelical Arminians‘ where you will find many Arminians who support the general thrust of Jacob/James Arminius’s theology. I, as a Reformed Arminian, am one of those, although not a member of that Society. Monergism is also a broad and sometimes confusing term. Its broadest sense points to God as the all-determining reality, which means that everything in nature and history is under the direct control of God. It does not necessarily imply that God causes all things directly, but it does necessarily imply that nothing can happen that is contrary to the will of God, and that God is intimately involved (even if working through secondary causes) in everything, so all of nature and history reflect God’s primary will…. Monergism especially means that God is the sole determining agency in salvation. There is no cooperation between God and the person being saved that is not already determined by God working in the person through, for example, regenerating grace’ (Olson 2006:18-19, emphasis in original). Matt Slick, a Calvinist, defines monergism as ‘the teaching that God alone is the one who saves. It is opposed to synergism which teaches that God and man work together in salvation. Cults are synergistic. Christianity is monergistic’ (CARM: Monergism). Slick is wrong about ‘cults are synergistic’ and ‘Christianity is monergistic’. The facts are that evangelical Arminians believe in a synergistic view of salvation. Cults may also do that, but that is not the point of my brief article. His view of Calvinistic Christianity is that it is THE Christianity and it is the one that is monergistic, which he considers is the correct view. Pelagianism denies original sin and considers that people have the human ability to live spiritual lives. Semi-Pelagianism is a modified form of Pelagianism in that it modifies the Pelagian original sin view that sinful human beings have the ability to initiate salvation by responding in good will toward God. I, as a Reformed Arminian, consider those two theological systems to be heretical. See my article, Calvinist misrepresents the Reformed. Justification thus originates in the heart of God. Realizing not only our lack of righteousness, but also our inability to attain to it, He in His kindness decided to provide a righteousness for us. It was His grace that led Him to provide it; He was under no obligation whatsoever to do it. In His grace He had regard to our guilt and in His mercy, to our misery (Thiessen 1949:365). This person online said of Arminians, ‘I have yet to meet one who does not hold to a synergistic idea’. But what kind of synergistic idea? The heretical Pelagian or semi-Pelagian, evangelical Arminian, etc? To which shade of synergism are you referring? She said, ‘They will say that you must “accept” this gift. If we have to accept anything, we are doing a work thus being a synergistic’. In my understanding that is a misunderstanding of synergism and of works. In my 53 years of being a Christian, I have heard a number of Calvinists want to include ‘accepting the gift of faith’ as a work. That is not the common understanding of salvation by works, which is a view promoted by some cults or false religion that teach that entrance into eternal glory (or whatever they call it) is attained at least in part by doing a certain list of good deeds or serving the church or organisation with some time or money. That is not the same as accepting a gift that is offered. If someone were to ask you, ‘What must I do to be saved?’ what would be your answer? Arminians include Pelagians and Semi-Pelagians? The reason I didn’t “provide any examples to support my claim” is because I didn’t come here to argue or debate. The original poster asked what the difference between the different beliefs were and I gave him a very general, over-simplified explanation. If the OP [original post] wanted a full explaination (sic) with every nuance and flavor, I’m sure he/she knows better than to get that info from a forum thread. I have never heard of a “Reformed Arminian.” I must admit that sounds like an oxymoron but I’ll also admit that the more I learn, the more I realize I don’t know. You learn something new every day. As far as which kind of synergistic idea I was talking about, I would say both Pelagian and Semi-Pelagian. I’ve met Arminians who hold to both but never one that holds to a mongergistic (sic) view of salvation. If someone were to ask me “What must I do to be saved?” I would probably tell them to believe in the Lord Jesus Christ and repent of their sins. However is someone asked my “How is a person saved?” I would tell them that God regenerated a person whom He has chosen from before time. He gives that person “spiritual eyes” to see Jesus for who He really is, to see their own sin and need for a Savior, and gives them the ability to believe and repent. But the work of salvation was already completed before the person was aware [6a]. She didn’t want to debate Arminianism. She is so misinformed about Arminianism that she does not know what a Reformed Arminian is. To her, Arminianism is synergism and includes Pelagian and Semi-Pelagian Arminianism. Salvation needs an explanation of regeneration, election and predestination. Salvation for that person was completed before the person was aware. There is considerable misinformation here that needs correction. She stated that she didn’t come to the forum for a debate. However, when she makes a statement such as, ‘Arminians are syncretists [she has since corrected this to mean synergists] meaning they believe salvation is both a work of God and man’ (as stated in #2) she is asking for a debate whether she says so or not. Why? Because to say that Arminians believe that ‘salvation is both a work of God and man’ is not what I as a Reformed Arminian and other Arminians believe (as in the Society of Evangelical Arminians). She stated that ‘I have never heard of a “Reformed Arminian” I must admit that sounds like an oxymoron….’ Jacobus Arminius was a minister of the Dutch Reformed Church to his dying day, so he was Reformed theologically and regarded his view as Reformed. A Reformed Arminian is one who accepts the soteriology (doctrine of salvation) and other doctrines as expounded by Arminius. Therefore, to use Reformed as only referring to Calvinism is not true. Reformed Arminianism is sometimes called Classical Arminianism. See Roger E Olson’s article, ‘Another Calvinist Misrepresentation of Arminianism‘. If you want to know more, Stephen Ashby has a summary article online, ”A Reformed Arminian view‘. 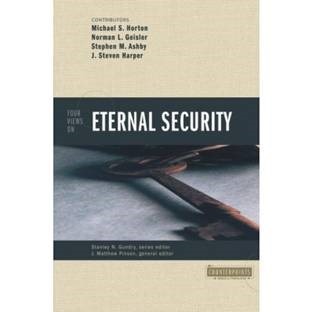 Ashby presented a Reformed Arminian view of eternal security in Four Views of Eternal Security (Zondervan) – Ashby’s exposition begins on p. 135. She stated that ‘I’ve met Arminians who hold to both [Pelagian and semi-Pelagian] but never one that holds to a mongergistic view of salvation’. To the contrary, ‘Arminianism is God-centered Theology‘. Could it be that she is unable to see God-centred theology in Arminianism’s synergism because she doesn’t seem to have read extensively in The Works of James Arminius? If she did, she would find that Arminius believed salvation was the work of God. What must I do to be saved? When the Philippian jailer asked Paul this question, Paul told him what to DO: ”(You) believe in the Lord Jesus and you will be saved, you and your household’ (Acts 16:31) and then Paul spoke the word of the Lord to him and those with him. This was followed by the jailer and his household being baptised (Acts 16:33). We have no direct indication of what Paul said when he spoke the word of the Lord to them, but he ‘rejoiced along with the entire household that he had believed in God’ (Acts 16:34). There is no mention in this text of Paul’s preaching regeneration, election and predestination in order for the jailer to be converted to Christ. Here is a summary of ‘The FACTS of Salvation: A Summary of Arminian Theology/the Biblical Doctrines of Grace‘. Enns, P 2008. The Moody handbook of theology, rev & enl. Chicago, IL: Moody Publishers. Governmental theory described by Paul Enns (2008:333). It was promoted by Dutch jurist, Hugo Grotius (1583-1645). Christian Forums, ‘Differences between Arminian, Calvinist, and Lutheranist?’, Constantine I #1, 11 March 2015. Available at: http://www.christianforums.com/t7869796/ (Accessed 15 March 2015). This is my response to kristea at ibid., OzSpen#18. The original edition was published in 1989. This entry was posted in Arminianism, Calvinism, Salvation on 16 March 2015 by spencer.